Sauropods were some of the most successful dinosaurs that ever lived, partly thanks to the way they used their long necks to reach food. But a new study of ostrich necks reveals that what we thought we knew about the evolution of these dinosaurs was wrong. After they evolved in the late Triassic, sauropods spread across all the continents, in a dazzling array of species and groups. Their defining characteristics include their incredible size (they were larger than all other types of dinosaurs), their long tails, their trunk-like legs and, of course, their long necks. But despite decades of research, there's still a lot we don't know about sauropods. And according to this new study, the dinosaurs' long necks weren't as flexible as previous computer models suggest— a finding with important implications for the behemoths' biology and ecology. Interestingly, a major point of contention among researchers has been just how the giants used their necks to get food. Some scientists think that sauropods held their heads up high and easily chowed down on leaves from the tallest of trees — this implies that their necks had to be very flexible to allow them to drink water from the ground. Recently, a team of scientists suggested that the dinosaurs have a swan-like S-curve to their necks, after looking at the natural neck posture of a number of extant animals, including cats, crocodiles and birds. But computer models say otherwise. 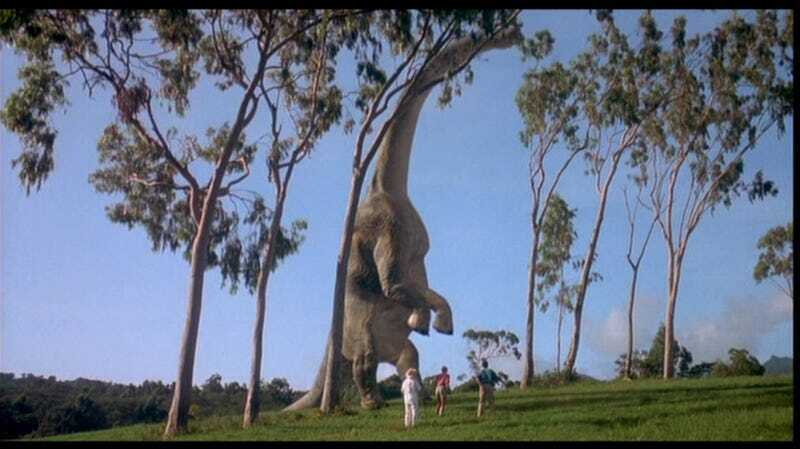 In 1999, reconstructions of the necks of Diplodocus and Apatosaurus suggested the dinosaurs held their necks horizontally and had less flexibility, meaning that they likely on fed on plant matter closer to the ground (small trees and brushes). This theory has been so widely accepted for a long time that it's been featured in a number of places, including the BBC's "Walking with Dinosaurs" and installations at New York City's American Museum of Natural History. Figuring out the flexibility of sauropods' necks is crucially important to scientists because it gives an estimate for the "feeding envelope" — the maximum range over which an individual can feed while standing still — of a given species, said Matthew Cobley, an evolutionary biologist at the University of Utah. Because sauropod species come in a variety of sizes and neck lengths, they have different feeding envelopes. And if sauropod necks were really flexible, the different species may have had a lot of competition for the same food. "Essentially, a lot of the previous studies said that what limits the flexibility of the sauropods' necks is how the bones articulate with each other," Cobley told io9. There's just one glaring issue with this approach: It doesn't account for the effects of soft tissues, such as muscles and cartilage. So Cobley decided to figure out how soft tissues affect neck flexibility by looking at an existing species. Probably the most obvious candidates for such an analysis are giraffes — they're four-legged and have long necks, after all. But they also have far fewer vertebrae than birds and dinosaurs, Cobley explained. "If we look at a giraffe, the flexibility is going to be very different just because of the sheer number of vertebrae," he said. Instead, he turned to ostriches, the closest long-necked relative to a sauropod. Cobley's approach was relatively straightforward. He used an instrument called a medical goniometer to measure the angles between adjacent vertebrae as he bent three donated ostrich necks. He repeated his measurements after boiling off all the muscles (leaving only bones and cartilage), after allowing the cartilage to dry and after removing the cartilage. From his measurements, he found that the ostrich neck can be divided into three main regions: the front part of the neck, which is slightly flexible; a very flexible section in the middle of the neck; and the stiff base of the neck. Importantly, he found that the neck became more flexible as he removed the soft tissues. "The soft tissue is what allows the neck to flex, but it also places an absolute limit on how far you can move the neck," Cobley said. "It seems common sense — and it is — but it's not something that was considered in detail before." This means, essentially, that computerized reconstructions that try to look at neck flexibility based on bones alone just don't cut it. But what do the results mean for the actual flexibility of sauropod necks? "The real answer is that we don't truly know," Cobley said. The research doesn't say how far sauropod necks could really bend, or how best to represent the animals to the public — it only suggests that what scientists thought they knew about sauropod neck flexibility is wrong. The study also suggests that sauropods may have exhibited a greater degree of resource partitioning than previously believed, with different species eating very different kinds of foods. This information could help scientists understand how the long-necked dinosaurs were so successful for so long. Cobley's work also has implications for the use of computer models in paleontology. Though the simulations can provide a number of insights into the lives of long-dead animals, including how hard they could bite and how fast they could run, scientists may run into issues if the models aren't based on real, empirical data. "If we are going to use computer models, they really need to be grounded in living animals before we present them to the public," Cobley said. Check out the full study in the open-access journal PLOS ONE. Inset images via blieusong/Flickr and Cobley et al/PLOS ONE.